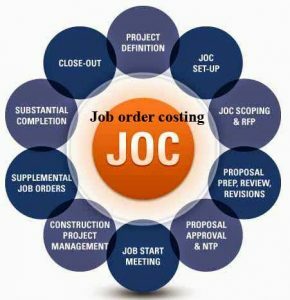 Classify these industries with respect to the type of cost accumulation procedure generally used–job order costing or process costing. The appropriate information on a job cost sheet. The sales price of the job, assuming that it was contracted with a markup of 40% of cost. There was no inventory of finished goods on May1. During the month, Jobs 373, 374, 375, 376, 378, and 379 were started.Materials requisitions for May totaled $13,000, direct labor cost, $10,000, and actual factory overhead, $16,000. Factory overhead is applied at a rate of 150% of direct labor cost. The only job still in process at the end of May is No. 379, with costs of $1,400 for materials and $900 for direct labor. Job 376, the only finished job on hand at the end of May, has a total cost of $2,000. T accounts for work in process, finished goods, cost of goods sold, factory overhead control, and applied factory overhead. c. Closing of over or underapplied factory overhead to cost of goods sold. Job 2 started in January, not yet finished. Finished goods inventory January 1, 19B. Purchase of materials on account. Acquisition of other overhead costs on credit. Jobs completed and transferred to finished goods. Raw materials were purchased on account, $410,000. Raw materials were requisitioned for use in production, $380,000 ($360,000 direct materials and $20,000 indirect materials). The following costs were incurred for employee services: direct labor, $75,000; indirect labor, $110,000; sales commission, $90,000; and administrative salaries, $20,000. Sales travel costs were $17,000. Utility costs in the factory were $43,000. Depreciation was recorded for the year, 350,000 (80% relates to factory operations, and 20% relates to selling and administrative activities). Insurance expired during the year, $10,000 (70% relates to factory operations, and 30% relates to selling and administrative activities). Manufacturing overhead was applied to production. Due to greater than expected demand for its products, the company worked 80,000 machine-hours during the year. Goods costing $9,00,000 to manufacture according to their job cost sheets were completed during the year. Goods were sold on account to customers during the year at a total selling price of $1,500,000. The goods cost $870,000 to manufacture according to their job cost sheets. Prepare journal entries to record the preceding transactions. Post the entries in (1) above to T-accounts (don’t forget to enter the beginning balances in the inventory accounts). Is manufacturing overhead underapplied or overapplied for the year? Prepare journal entry to close any balance in the manufacturing overhead account to cost of goods sold (COGS). Do not allocate the balance between ending inventories and cost of goods sold (COGS). Based on the 80,000 machine-hours actually worked during the year, the company would have applied $480,000 in overhead cost to production: 80,000 machine-hours × $6 per machine-hour = $480,000. Hello, thanks so much for providing these exercises. I enjoyed completing them. For your information, Exercise 5 contains a couple of errors. Journal Entry #3 cites administrative salaries at $20,000.00, but in the Solutions section, administrative salaries are posted in the journal at $200,000.00. The T account for Work in Process in the Solutions carries an opening balance of $20,000.00, but the balance given in the actual question is $15,000. You give the final balance for the Work in Process T account as $30,000.00. That sum could only be arrived at with a $15,000.00 balance. These are small issues in an otherwise great series of exercises, and I hope you find my comment helpful.